Arayo's Ride: Vikings Lust After Arayo's Hide? The Viking woman rushed to Arayo, dug her fingers into her fur and exclaimed "Oh, could I make something warm and wonderful out of you!" Looking at the various animal hides draped around the room, I think of the poor creatures who once lived within them and I pull Arayo closer to me and away from the woman's grasp. Soon, we were joined by 3 other women. Dressed as the Vikings in this historical site, the women all begin picking through Arayo's fur, looking for undercoat that could be used for spinning. I recall the two evenings I spent just a few days ago, combing out bags full of undercoat and wish I'd put off that chore. These women would have made quick work of it and the fur would have gone to better use than filling a waste basket. L'Anse aux Meadows National Historic Park pays tribute to the Norse expedition that came to Newfoundland from Greenland 1,000 years ago. Searching for hardwood lumber, they brought along their slaves (mostly Irish), built homes and established this outpost to house roughly 60 - 90 people. Homes were constructed of sod and stone - the 6 foot thick walls providing more insulation from the weather than most homes have today. This site at the northwestern tip of Newfoundland, was officially "discovered" in the 1960's and is the only recognized authentic Viking site in North America. Photos: Arayo becomes part of History at L'Anse aux Meadows National Historic Park in Newfoundland. 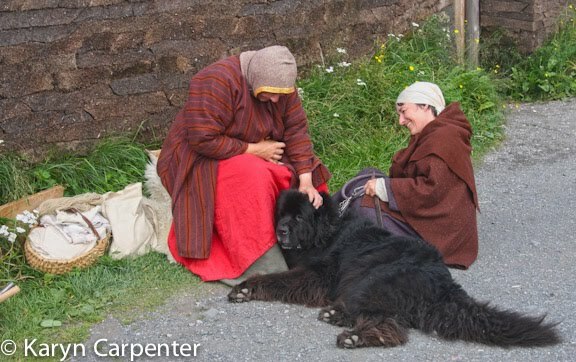 As Arayo is a leaner, she managed to rest on one of the women who were attempting to harvest her fur and knocked her to the ground. OH Karyn You make me want to follow you path. What beautiful pictures!!! Don and I must come visit Newfoundland. So, hit the road! We'll probably still be here if you leave today and it can be another gathering of the crazy Newf dog people! I managed to miss Arayo - I was elbow deep in the iron furnace. 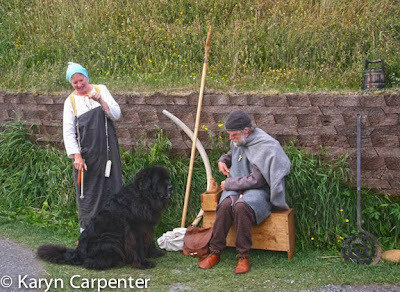 Of course the Newfoundland breed is much more modern than the Viking Age. Did the Norse bring dogs with them to Vinland? Well we will never know. The Norse certainly kept dogs (and cats) but these appear to have been mainly work animals, rather than pets. We know from archaeology that there were dogs at the Greenland colony, at least at its last stages in the 1400's. So sorry we missed you, Kettil! 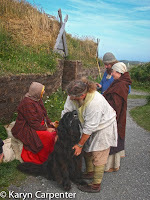 It was fun taking a Newf to Newfoundland - even if the Vikings came first!